Our commitment to spiritual growth is key to the vibrant, joyful atmosphere that distinguishes Tyburn Academy. "He is the source and He loves you and He will never ever leave you no matter what you do, no matter what you hear, no matter what you see, no matter what may happen or why it happens. You are never alone. He knows you. So let him walk with you on campus, be with you in your classes, talk with you in your rooms, speak through you to those you encounter, shine in your hearts and on your face because you have Him as your source of what is good, what is true and what is beautiful. " At Tyburn Academy your child is no ordinary child. Your child is loved, your child is willed, and your child is necessary. 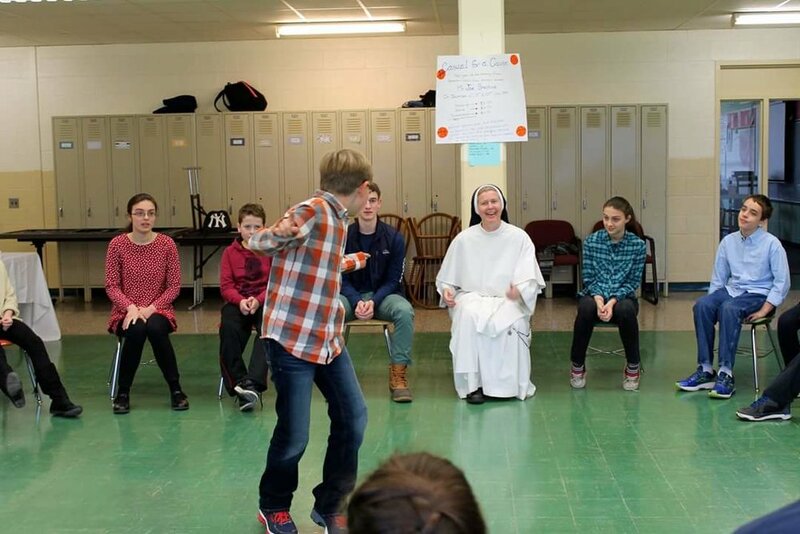 We seek to offer our students opportunities where they can hear His voice - through prayer, through solid and dynamic religious instruction, through participation in the sacraments and through service to others. Our teachersaim to be witnesses of the Gospel teaching by example. Our goal is that students who come to Tyburn Academy will leave more convinced of their own call to holiness and will be willing to respond to the specific way God is calling them to bring Him to the world. " "Young people are the window through which the future enters the world."